Central Bank wants bank execs to ‘take a long hard look in the mirror’ over tracker scandal. 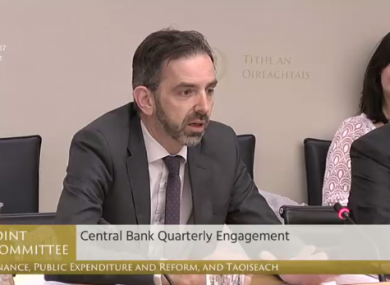 Ed Sibley appeared before the Oireachtas Finance Committee last month to discuss the action being taken by the Central Bank in relation to the scandal. THE DEPUTY GOVERNOR of the Central Bank has said he expects board members of banks who overcharged their customers to be held to account for the damage caused by the tracker mortgage scandal. Speaking today at the Eversheds Sutherland Conference, Ed Sibley said decisions had been made in the short-term interests of the shareholders and there was a focus on whether decisions were legal “with too little consideration of whether they were ethical or in the interests of the customer”. He said the behaviours and underlying culture within financial services firms had been “wholly inappropriate”. “I expect all the main banks will be subject to Central Bank enforcement investigations. As part of these investigations, interviews with relevant individuals have been and will be conducted, and large volumes of documentation have been and will continue to be gathered and reviewed,” Sibley said. Moreover, I expect the boards, the individuals on the boards and the executives to be accountable and to be held to account for not only the initial decisions which started the consumer detriment, but the persistent and ongoing behaviours and decisions that magnified this harm over an extended period. As well as answering to the Central Bank, I would expect them collectively and individually to be taking a long hard look in the mirror, and as pre-approved control function holders to be actively considering their responsibilities regarding disclosure and whistleblowing. He said the Central Bank is “under no illusion” that continued pressure is required to ensure all affected customers receive redress and compensation and banks comply with its findings. His speech comes as Danske Bank released publicly for the first time information about the number of its customers impacted by the scandal. The bank has identified 60 accounts where the incorrect margin was applied and customers were charged the wrong rate of interest. It said the margin error is 0.26% on average. A further 18 customers who may have had a reasonable expectation of a tracker rate when their fixed term passed were not offered the option, or it was not made clear to them that they had the option. None of these errors, according to Danske Bank, resulted in the loss of ownership of property. The bank has set aside €600,000 to cover costs of paying back and compensating impacted customers. It will be writing to those affected with an offer of redress and compensation by mid-December. Danske Bank said it would like to “sincerely apologise for the errors and any distress caused to impacted customers”. Bank of Ireland finally forced into doing right thing with tracker scandal pledge. Ulster Bank and AIB offer fresh apologies on tracker mortgage scandal.